What factors should I consider when choosing a battery charger? 1. How many battery banks will you be charging? Take into account service battery, starter, bowthruster, etc. Also consider any possible future extension of your system (= sufficient battery charger outputs). 2. The battery charger must have the same voltage as the battery, i.e. 12 V battery voltage = 12 V battery charger. And 24 V battery voltage requires a 24 V battery charger. 3. Charging the batteries safely and quickly requires sufficient charge current (measured in amps). See the battery charger specifications in this Powerbook for the recommended capacity. Example: A 200 Ah Gel battery requires a battery charger of at least 25 amp. When multiple loads are connected during the charging process (e.g., heaters, refri­gerator, lighting) a battery charger of 50 amp is needed. If the battery charger is powered via a generator instead of the grid, a battery of 100 amp would be recommended. A larger battery charger shortens the charge times and allows the generator to operate for shorter periods. This enhances comfort levels and is better for the environment. 4. For the simple and often cheaper battery chargers, the charge current is specified for the nominal battery voltage (= 12 or 24 V). Charging a battery requires a higher charge voltage, namely 14.4 or 28.8 V. If the charge current drops at this (higher) charge voltage, it will take much longer for the battery to be charged. This results in a shorter lifespan of the battery or a longer generator time (if the battery charger is powered by a generator). Battery chargers from Mastervolt provide a full charge current, even at a high charge voltage and high ambient temperatures. This ensures short charging times and an optimal lifespan for your batteries. What type of battery can I charge? Mastervolt battery chargers are suitable for all types of batteries. Full details can be found in the battery charger specifi­cations under ‘Charge characteristic’. Mastervolt recommends choosing a battery charger with sufficient capacity and, if possible, connecting it to a battery temperature sensor and battery voltage sense. Always connect Lithium Ion batteries in accordance with the supplied instructions and follow the installation guidelines carefully (temperature compensated charge is not needed). Can I charge different types of Lithium Ion batteries? Most Mastervolt battery chargers can charge Lithium Ion batteries. When using the modern Mastervolt Lithium Ion batteries (MLI and MLS series), free downloadable configuration software (MasterAdjust) allows you to simply adjust the battery charger. Other charge characteristics can also be easily installed. Do note that all Lithium Ion batteries should be installed in accordance with the manufacturer’s instructions. Can a Mastervolt battery charger remain connected throughout the winter? Yes, that’s not a problem. Mastervolt battery chargers are safe to use and it is even better for the batteries themselves. The charge voltage is regulated in accor­dance with the battery temperature to ensure the batteries remain in optimum condition, increasing their lifespan. The 3-step+ charging method ensures a monthly absorption cycle so the battery stays active. I sometimes have a limited fuse rating via the AC grid. Can I still use a large battery charger? Yes, you can. All Mastervolt battery char­gers and Combis are fitted with the latest electronics, reducing their power consumption by about 40 % compared to conventional battery chargers. 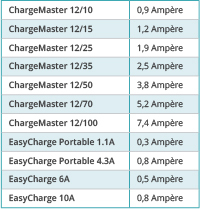 For example, the power intake of Mastervolt 12-volt battery chargers is summarised below for 230 V models. 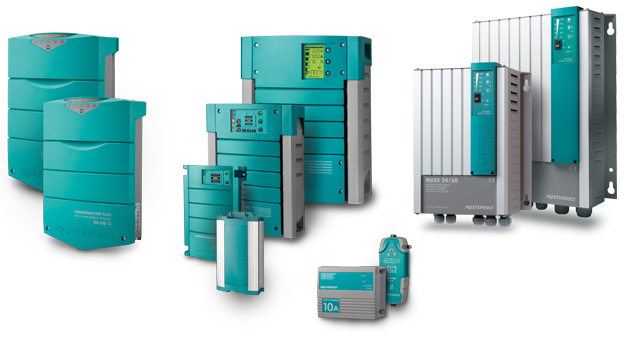 The levels of current specified are relevant to maxi­mum capacity operation, i.e. at the moment the battery charger supplies its full capacity. In addition, each battery charger with a charge current higher than 15 A (12 V) can be equipped with a remote control panel. This is not useful for smaller battery chargers as the current consumption will be minimal. Using a remote control panel allows you to further reduce the outgoing charge current, as a result of which the battery charger uses even less power from the grid. This prevents fuses from blowing, but will slightly increase the charge time. Can I install my battery charger in the engine room or compartment? Mastervolt battery chargers can easily be installed in the engine room. Even at high temperatures, Mastervolt battery chargers provide the maximum charge current, safely and quickly charging the batteries. The output current will be automatically reduced if the ambient temperature becomes very high. Can I charge batteries separately? A number of models are fitted with three outputs, allowing three battery banks to be charged independently of each other. Most Mastervolt battery chargers have an additional output for a starter battery. This output supplies for example the starter battery with a maintenance charge. It is also possible to charge multiple battery sets via a battery isolator (also known as a diode splitter). The resulting voltage loss is compensated by a setting in the battery charger or by connecting the battery sense cables. Can the battery charger be connected to the same battery isolator as the alternator? Although this is possible, it is better and more convenient to fit two separate battery isolators. If this should be problematic, use the battery isolator for both. In this case, make sure that the battery isolator or Battery Mate is powerful enough to simultaneously handle both the battery charger and alternator current. What should the cable diameter be between the battery charger and the battery? When calculating the required diameter of these cables follow this rule of thumb: 1 mm² of cable thickness for every 3 amps. A battery charger of 50 amps, for instance, calls for a cable of 50:3 or 16.6 mm². The standard cable closest to this is 16 mm². This applies when the distance is three metres at most. For longer distances you will require a thicker cable. What is the maximum distance allowed between the battery charger and the batteries? In general, three metres is the maximum length when you are using the calculation method described earlier. A cable length of 6 metres is also possible, but thicker cables must then be used. The previously provided example would require 25 mm2 cables. Can I parallel connect a battery charger to the alternator? It is possible to parallel switch the battery charger to an alternator of, for example, the propulsion engine. This situation occurs when the engine is running and a 230 V generator is started simultaneously. How long will it take before my batteries are fully recharged? The charging time of a battery is directly related to the ratio of battery to charger capacity. Other important factors that decide how long it takes for an empty battery to completely recharge are the battery type and the power consumption of the potential consumers. As a rule of thumb for lead acid batteries, divide the battery capacity by the maximum charge capacity and add four hours. The four hours are for the absorption time, during which the battery determines how much more current is necessary and the battery capacity increases from approx. 80 % to 100 %. Of course, this rule does not consider the power consumption of other connected equipment: If loads such as a refrigerator or lights are connected, their power consumption needs to be subtracted from the available charge capacity. Example: Take an empty 200 Ah battery, a 50-amp battery charger and a connected load consuming 10 amps. Charging time in this case would be around 200/(50-10) = 5 h, or 9 h in total including four hours of absorption time. If the batteries are only half-discharged, the recharge time would be 100/(50-10) = 2.5 + 4 h, 6.5 h in total. The absorption time is shorter with Gel and AGM batteries – around two to three hours. These types of battery will therefore recharge faster than conventional ones (see also ‘Charging batteries’). No matter how thick, every cable has some resistance, resulting in a certain amount of voltage being lost between the battery charger and the batteries. This voltage loss depends on the thickness of the cable and the battery charger current. A battery charger measures as standard the voltage at its output terminals. Due to the cable losses the voltage is higher than the battery voltage. The output voltage of the battery charger minus the voltage loss across the cables is the battery voltage. When a lot of voltage is lost on the cables, the battery charger might switch to the absorption phase too early, which means that the battery will not become fully charged or charging time will increase. To compensate for voltage loss via the cables, sense wires have to be connected between the battery charger and the batteries. These (thin) cables ensure that the battery charger measures the voltage directly on the positive and negative terminal of the battery instead of on the output terminals of the battery charger. The voltage lost during charging is compensated and the batteries are charged quickly and effectively. The voltage drop over, for example, a diode splitter (battery isolator)can also be compensated in this way. What is 3-step+ charging technology? In the bulk phase, the battery charger delivers its maximum current, e.g. 50 amps for a ChargeMaster 12/50 and battery voltage increases. The duration of this phase depends on the battery capacity, charger capacity and any consumers connected to the battery during charging. The bigger the battery, the longer this step takes; the larger the charger, the shorter the stage. If consumers such as a refrigerator is connected, they will also need to be powered by the charger, reducing the charge current going into the batteries and increasing the time necessary for charging. The second step, the absorption phase, begins once the battery has reached its maximum voltage. At this point the battery is around 80 % full, and the charge current begins to slowly decrease. At 25 °C, the maximum voltage is 14.25 volts for a 12 V battery and 28.5 volts for a 24 V one. In this stage the battery is charged to the full 100 %, which takes approximately three to four hours, depending on the battery type, the battery charger and the charge amount. Once the battery is fully charged at the end of the absorption phase, the float phase begins. The Mastervolt battery charger switches over to a maintenance voltage so that the battery remains fully charged and in optimum condition. Any existing consumer loads are also powered. The charger remains in the float phase until the battery voltage falls due to a major load, or the battery charger is unplugged because the power connection was removed. Most Mastervolt battery chargers are equipped with an extra step, the PLUS phase. During periods when the battery is resting, an absorption cycle lasting one hour will take place every 12 days to ensure that the battery stays in perfect condition. During the absorption phase, the battery accepts progressively less current. Once the charge current remains under a certain level for a given period of time, the battery is considered to be fully charged. This maximum charge current is called the Return Amps, and the corresponding period the Return Amps Time. The battery charger takes this as a signal to switch over to the next step, the float phase. Just like many other parameters of the battery charger, Return Amps and Return Amps Time can be set by the installer with the help of software that is freely available on the Mastervolt website. In fact, the installer can use this software to customise the battery charger to your onboard system requirements. What is a temperature sensor for? When charging the battery, the exact charge voltage is of the essence. The charge voltage must be adjusted to the temperature of the battery. When the battery is cold, the charge voltage must be slightly higher to charge the battery fully. In high ambient temperatures the charge voltage must be reduced to ensure the battery is not overcharged. Mastervolt battery chargers are set as standard to a battery temperature of 25 °C. When the temperature sensor is connected to the charger, the output voltage will vary by 0.03 V per °C for a 12-volt system and 0.06 V per °C for a 24-volt system. This is in accordance with the advice of most battery manufacturers. At a temperature of 15 °C for instance, the maximum charge voltage for a 12-volt system is 14.55 volt, and at 30 °C it is 14.1 volt. The corresponding values for a 24-volt system are 29.1 and 28.2 volt. At a temperature of 12 °C the voltage is not further increased to protect the connected loads from excess voltage. At 50 °C the charge voltage will be reduced to 12 or 24 V to protect the battery in these high temperatures. The connection of a temperature sensor ensures that the battery is quickly and safely charged with the right voltage. How can I charge batteries with limited power? When multiple large battery chargers are parallel switched, the available 230-volt connection is often insufficient. Connect one of the battery chargers to prevent the AC connection from overloading. Although this will increase the time needed for charging, you are normally connected to the grid for a longer period of time (overnight) anyway. Both battery chargers can be powered if the generator is running, as the generator usually delivers more output than a power connection. The two battery chargers will not cause the power connection to be overloaded. Another possibility is equipping the vessel or vehicle with two 230-volt connections. Which battery charger is necessary for a battery capacity of 200 Ah and a 100 Ah starter battery? The starter battery is generally not considered when calculating the charger capacity – it is only used for starting the engine and will therefore tend to be only partially discharged if at all. While you are using the engine, the alternator recharges the battery and when connected to the grid, it is charged via the second output of the Mastervolt battery charger. As a rule of thumb, a charge capacity of 25 % (up to 50 % for Gel batteries) of the battery capacity is sufficient to charge the battery quickly and safely, and also power the onboard systems. For a battery of 200 Ah, for instance, a battery charger of 50 amps would be appropriate. Is having 10 % of my battery capacity as charge capacity sufficient? Definitely not. You can assume 25 % and up to as much as 50 % with Mastervolt batteries. The old 10 % rule was common in the days when battery chargers had no current and voltage regulation, and too high a current could overcharge the batteries. Mastervolt battery chargers have perfect current/voltage regulation and are also equipped with a temperature sensor that ensures the voltage is regulated according to the battery’s temperature. Several loads are connected while charging the batteries and these loads are also powered by the charger so the available charge current for the batteries will be reduced. Can multiple battery chargers be parallel connected? In addition to simply being chargers, Mastervolt battery chargers also provide power for the 12 or 24-volt onboard system. They can easily be parallel connected should you wish to increase capacity. In fact, this is often the only way to power your 12 or 24-volt system with the 230 or 400-volt power connection. Similarly, should you need a charge current higher than 100 amps, several battery chargers can be parallel connected. A parallel system with multiple battery chargers does not require any special equipment. It can be installed in exactly the same way as a single charger, except that each charger will have its own cables leading to the battery or the DC distribution. Wiring for the voltage compensation is also connected separately for each charger. The temperature sensor for each charger needs to be separately connected to the battery that you expect to reach the highest temperature. If the chargers and sensors are properly linked, the charge current will be evenly distributed over the connected chargers. The possibility remains that one of the chargers will switch to the absorption phase sooner than the others. This is a perfectly normal phenomenon caused by tolerances in the adjustment, with no effect on charge time and charger operation. When parallel connecting multiple battery chargers, we recommend that they be of the same model, type and charge capacity. For instance, when a 100-amp charger is linked parallel to a 50-amp charger, the charge current will not be evenly distributed over both. Although this will not affect the charging process or be detrimental for the chargers, it is more efficient to install two chargers of 75 amps each.